Works Great and looks good. Tablet has lite signs of use. Keyboard has normal signs of use. Full Reset ready to work for you. 128 GB Flash Storage. Palm Block technology lets you rest your hand on the tablet as you write. Windows 10. 12" screen with 2160 x 1440 resolution. This high-resolution screen is ideal for Web browsing, studying, reading and streaming HD content. Microsoft combines the portability of a tablet and the performance of a laptop with the Surface Pro 3 256GB 12" Multi-Touch Tablet.The Surface Pro 3 features a 12" ClearType Full HD Plus widescreen display with a 2160 x 1440 native resolution, which allows you to play Full HD content with ease. DELL LATITUDE 12 5290 8th Gen Touchscreen Tablet. Dell Latitude 12 5290. Fast I5 8th Generation CPU. 256 Gb SSD. Windows 10 Professional. We stand behind our product 100%! Physical Characteristics. Battery Capacity. 4K UHD Resolution. We stand behind our product 100%! Physical Characteristics. Battery Capacity. Lithium Ion (Li-Ion). Battery Chemistry. Number of Cells. Battery Information. Windows 8.1 Allows you to remain connected and productive. Also includes 1 year of Asus WebStorage. Wi-Fi (802.11a/b/g/n) Enables rapid Internet connectivity while within range of a wireless network. Capacity: 128GB. Verizon Wireless. Samsung W727 Galaxy Book Verizon Tablet. Get the full power of a laptop in a thin, lightweight design. Since this tablet is locked to Verizon, 3G/4G can only be used on their network. DELL LATITUDE 12 5290 8th Gen Touchscreen Tablet. Dell Latitude 12 5290. Fast I7 8th Generation CPU. 256 Gb SSD. Windows 10 Professional. We stand behind our product 100%! Physical Characteristics. Battery Capacity. 128GB of Flash Storage. The tablet that can replace your laptop. Surface Pro 3 tablet is in a category of its own. It may just be the ultimate device. Write directly on the screen with the included Surface Pen. NEW - Verizon Samsung Galaxy Book SM-W727VZ 12" Tablet 128GB WiFi and 4G LTE. Samsung Phones. Samsung Tablets. in 26 states across the US. Motion Computing R12 Tablet i5 @ 1.5Ghz 4G 128G-SSD Windows 10 . Charger/wireless keyboard/usb adapter included. USPS Shipping. (HDD: 128GB SSD. RAM: 4GB DDR3. - Microsoft Surface Pro 3 Tablet. Manufacturer: Microsoft. OS: Windows 10. Surface Pen not included! ). 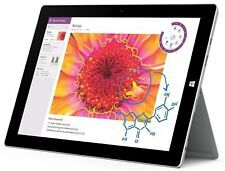 Microsoft Surface Pro 3 i5-4300U 1.9Ghz 128GB 4GB 12" Tablet Computer. 4GB DDR3 RAM. Microsoft Surface Pro 3 12" Tablet. Keyboard and stylus are NOT included. Screen is in good condition without dead pixels or pressure marks. Hard Drive : 64GB HD. This TABLET is inexcellent working order. It has been fully tested and it works great! We've fully wiped the previous user's data and re-installedgenuine Windows 8 PRO. Built in Headphone Jack. 256GB M2 SSD storage capacity. Product TypeTablet Computers. This Certified Refurbished product is tested and certified to look and work like new. Model: W700NZKAXAR. Brilliantly designed to be thin and light, the stylish 2-in-1 Samsung galaxy tabpro s is ready for anything, anywhere. Thin and light, the galaxy tabpro s is designed with the sleek lines you expect from Samsung. Model Number T8Z06UT#ABA. Form Factor Slate. Solid State Drive Capacity 256 GB. Product Line Elite x2. Product Type Tablet. Training / Self Study. Processor Core Dual-core (2 Core. Processor Type Core M. ). Fully functional. It is in okay condition, but the back of the tablet has a considerable amount of scratches. The front glass has no scuffs or scratches. Only the tablet is included. No accessories. DELL LATITUDE 12 7212 RUGGED. Super Fast Core I5 7th Generation CPU! I5 7th Generation. Two batteries. Windows 10 Professional. We stand behind our product 100%! Physical Characteristics. Battery Capacity. Excellent condition. Restored with updates. Microsoft combines the portability of a tablet and the performance of a laptop with theSurface Pro 3 128GB 12" Multi-Touch Tablet. There are also built-in stereo speakers with Dolby audio. MICROSOFT MQ2-00019RB-D. Complete connectivity. Bundle Edition Supplied with the Official matching LINX 12X64 Keyboard Cover Dock . Stay entertained wherever you go with the Linx 12X64 - YouTube. Kick back and enjoy the view. Microsoft combines the portability of a tablet and the performance of a laptop with theSurface Pro 3 128GB 12" Multi-Touch Tablet. There are also built-in stereo speakers with Dolby audio. MICROSOFT MQ2-00019RB-A. Microsoft combines the portability of a tablet and the performance of a laptop with theSurface Pro 3 256GB 12" Multi-Touch Tablet. There are also built-in stereo speakers with Dolby audio. MICROSOFT 5D2-00017OB. Microsoft Surface Pro Tablet. OS:Windows 10. Make: Microsoft. Best of a laptop. Best of a tablet. Form Factor : Slate. Product Type : Tablet. Larger screen, lighter form. 256 GB Flash Storage, 8 GB RAM. Product Family : Surface Pro 3. CUBE iwork12 uses magnesium alloy back, high hardness and in tensity. 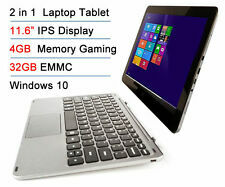 Cube iWork12 Dual Boot Tablet. Windows 10, Included Product Key Windows has pre-installed all the professional programs and tools suitable for any of your needs.